"The bear took my face and eyes, not my dignity, and not my ability to dream, and dream large." ~Beyond the Bear, p. 206. Dan Bigley was a nature-loving, fast-paced adventurer who would grab his gear and go fishing at a moment's notice. He had just fallen for a beautiful woman, Amber. The day after he and Amber decided to start dating, while returning from fishing with his friend, a mama bear viciously mauled Dan. He hung to life by a thread for weeks. Teams of doctors reconstructed his face and fixed his wounds the best they could, but his eyes could not be saved. He woke from his medicine-induced state totally blind. It took time and, most of all, love, for Dan to move "beyond the bear." The words "inspiring" and "inspirational" are used frequently and often inappropriately when it comes to blindness. John gets out of bed, brushes his teeth, and goes to work. All while blind! How inspiring! 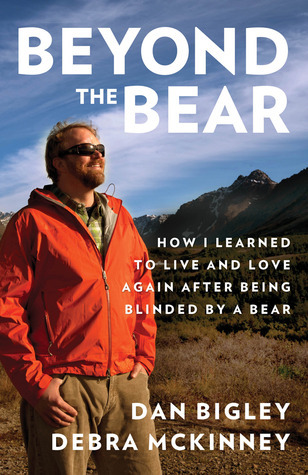 However, I did find Dan Bigley's story in Beyond the Bear: How I Learned to Live and Love Again After Being Blinded by a Bear to be inspirational, but not in the typical, "oh, the poor blind guy" sense. Dan's story, beautifully co-authored by Deb McKinney, shows that determination, motivation, positive thinking, and great force of will can get you through anything, even an almost-fatal bear mauling. Before he knew he was blind, Dan made a conscious decision to live and not to regret that decision. This story is not inspirational because of Dan's blindness; it is inspirational because of Dan's sheer force of will and outlook after life threw him a curveball. Yet, Beyond the Bear is so much more than a story of a bear mauling and the survivor's recovery. Love story, friendship, science and nature, medicine, humor, spiritual…Whatever your interests, you will likely find something to love about this book. The story is told from Dan's perspective. He is honest, upfront, and candid with the reader. He shares his innermost thoughts and feelings. Dan details the events of his life, but he neither keeps to the dry facts nor exaggerates everything. The writing is beautiful and enthralling. You will not want to put this book down. Dan's discussion of blindness and his journey after becoming blind is frank and sincere. Being mauled by a bear is traumatic enough, but waking up afterwards having to learn how to do so many things in a new way, having to form a new relationship with the world around you, is also traumatic at first. Dan is honest about his and his family's initial reactions to blindness. However, he did not make a commitment to live just so he could sit in his house all day and feel sorry for himself. He wanted not only to live, but to have a full, wonderful life. He describes his journey through learning how to be a blind guy, so to speak, from his first piece of assistive technology—a talking watch—to his struggles with college-level statistics, his decision to have a guide dog, and eventually his employment and family life. I would wholeheartedly recommend Beyond the Bear to anyone--those who are blind, and those who are not. I do have one cautionary note. The authors do not shy away from the details of Dan's mauling and his injuries, some of which are graphic. These details are not gory for the sake of being gory. They have a purpose and a place. I applaud the authors' straightforwardness. However, it may be necessary for some readers to skim over these details. Beyond the Bear is a fantastic, mesmerizing read. Visit Dan Bigley's website or view the book on Amazon.com.